Many, many years ago at an obedience event, my Belgian got into a row with a Bouvier. From the moment we reached the site this Bouvier took an immediate dislike to my dog. Because the venue was pretty small, there was no avoiding this dog, but we kept our distance as much as possible. It wasn’t enough; this dog went from staring to rigid staring, to snarling, growling and barking. To avoid any problems I had my dog with his back toward the dog in the “front” position for an extended period, giving him a break only when the other dog turned his back, which wasn’t often. The judge had noticed the Bouvier and placed one dog between us during the long stays. The sit went without a problem and the down was perfect, until I gave him the cue to let him know we were finished. As I bent down to get the leash, he calmly walked to the aggressive dog and mounted him!! The Bouv initially seemed too stunned to react. The owner reacted like it was happening to her; she freaked. The Bouv took some courage out of this and a scuffle ensued but no one was hurt. Did I deplete my dog’s self control with the prolonged front and long stays, creating what I was hoping to avoid? The recently published study titled, “Too dog tired to avoid danger: Self-control depletion in canines increases behavioral approach toward an aggressive threat” looked into this very issue. Studies have demonstrated that self control depletion results in impaired inhibition and results in people making less than optimal choices, everything from gambling more and giving up quicker when solving an intractable problem. Like in every part of life there is a trade-off; achieving temporary self control means losing some of it later on. a) A standard requires a clear picture of what you are supposed to be doing: drive at 60mph/100kph, run 30 minutes every day, heel, sit, etc. 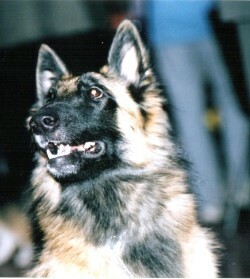 No having a well defined standard is often seen in the obedience ring; often it is very obvious that dog just doesn’t understand the exercise. b) Self-monitoring requires the subject to compare the standard being kept in mind to what it is actually doing and if necessary to make adjustments. Without self-monitoring a dog would not be able to change pace or turn during a heeling exercise. c) Willpower, or self-regulatory strength is a limited resource and is depleted from self-regulation exercises. d) Without motivation nothing happens. In this study compared the approach to an aggressive dog in two groups of dogs. The self-control group had to sit for 10 minutes with an electronic hamster distraction – depleting it’s resources – before given access to the aggressive dog. The other group was in a cage for the same amount of time. The depleted (self control) group was less able to inhibit it’s approach to an aggressive dog than the control group, showing the same kind of risky behavior observed in depleted humans. When dogs were depleted, as compared with when they were not, they were less able to inhibit their predisposed approach behaviors. As a result, dogs approached an aggressive dog more when depleted than when nondepleted. 1) Keeping sessions short so as not to deplete the animal’s resources. Short training sessions is the normal recommendation for pups but it seems to be less of a concern for adult dogs. Short sessions might be of special importance when working dogs with limited self control who tend to display risky behaviors. 2) The use of food rewards high in glucose as they’ve been shown to mitigate the risky behavior associated with depletion. Having an interest in evolutionary biology, I found the last paragraph particularly interesting, specially for those people who insist in yelling “treat a dog like a dog” as they yank and crank their helpless animal. Something to think about when deciding what kind of relationship you want to have with your dog. The claim of ‘it’s only a dog’ or ‘treat a dog like a dog’ (whatever that means) just doesn’t fly. We are more alike than unlike. Miller. H.C., DeWall, C. N., Pattison, K. F., Molet. M., & Zentall, T. R. (2012) Too dog tired to avoid danger: Self-control depletion in canines increases behavioral approach toward an aggressive threat. Psychon Bull Rev 2012 Mar 30. Miller, H. C., Pattison, K. F., DeWall, C. N., Rayburn-Reeves, R., & Zentall, T. R. (2010). Self-control without a self? Common self-control processes in humans and dogs. Psychological Science, 21, 534–538. Schmeichel, B. J., Harmon-Jones, C., & Harmon-Jones, E. (2010). Exercising self-control increases approach motivation. Journal of Personality and Social Psychology, 99, 162–172. Very, very interesting article and study, I learned quite a bit. My Akita had a similar situation in obedience school, albeit without a good or funny ending. You would have found much to write about from this incident, from the behavior leading up to the clashing to the instructors handling of the incident. A Dalmatian was stalking my dog the whole class until finally my dog had enough of the snarling and staring while I desperately tried to keep him focused and under control. He remained obedient yet was clearly stressed, and had one eye on the Dalmatian the entire time. The foolish Dalmatian attacked him at a full run from the other side of the show arena during a long sit/stay, and the worst fight in all of dog school broke out, leaving the show Dalmatian without an ear among many other serious injuries. End of his conformation career came at the expense of his need to be ‘top dog’. My dog had an ear piercing, so did not get off scot-free. The trainer was a big burly guy and could not break up the two combatants. He finally let me into the bloody melee to pull my dog off. Unfortunately for me, my dog was the one kicked out of school, when he was not the instigator or aggressor, just the ‘winner’ of the battle. Bram never was comfortable around certain breeds thereafter. Even watching the Westminster Dog show on TV, Bram attacked the TV when the Dalmatians were showing. I know it is weird, but both my dogs would watch the show with me. Thank you. I had heard of depletion, but learned quite a bit writing this too. I can sympathize with your poor dog. t’s always the winner or the bigger dog that takes the brunt of the blame. It’s the same story in parks too, when little dogs cause the fights and big dogs take the blame.